Science Objects are two hour on-line interactive inquiry-based content modules that help teachers better understand the science content they teach. This Science Object is the third of four Science Objects in the Energy SciPack. 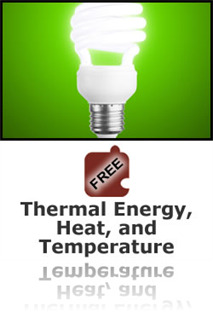 It provides a conceptual and real-world understanding of the relationship between thermal energy, heat, and temperature. The thermal energy of a material consists of the disordered motion of its atoms or molecules. Thermal energy can be transferred through materials or from one material to another by conduction (the collisions of atoms), or across space by radiation. If the material is fluid, convection currents aid the transfer of thermal energy (convection). When thermal energy is transferred it is called heat. Temperature is a measure of the average kinetic energy of atoms and molecules in a material. Informative, easy to understand, lots of great practical examples, simulations and explanations. I would recommend it for any teacher who would like to understand how molecules respond under various temperatures and heat and how energy is transferred from one object to another via thermal energy, conduction, convection and radiation. I really enjoy Science Objects. In 1-3 hours, the Energy: Thermal Energy, Heat, and Temperature Science Object will help me re-learn, refresh, or learn for the first time some critical science concepts I will have to know to obtain my Science Educator credentials. I appreciate that I can complete them at my own pace, and that, if used as park of a SciPack, I have access to a content expert to go to for help. The NSTA Learning Center Science Objects are really beneficial! This resource and the ones like it are particularly valuable for me for several reasons. First, I like the table of contents off to the left, which all ow me to keep track of what is coming up and see the entire lesson at once. Also, it is multisensory...engaging several senses. Finally, they are self paced, which I really need with my busy lifestyle. Awesome simulations of heat transfer. Great explanation of conduction, convection, and radiation. I recently started teaching an unit on energy. This science object was a great tool to help me refresh on the content before I teach it to my students! It also had some good resources for me to show and share with my students. This presentation on the concepts of Thermal Energy, Heat, and Temperature made the dividing lines clearer and more defined than ever. Exciting, informative, and organized. I was thorougly engaged in this Science Object. I think that the interactives were very helpful and useful - even if in a classroom setting! Heat and temperature are concepts that people have many misconceptions about. This SciObject uses simulations and animations to make the concept of heat and heat transfer concrete. It also includes embedded assessments so that teachers, elementary through high school, who enhance their content knowledge using this SciObject can gauge their progress. I once showed a college student one of the animations and she said that it was the first time she could actually "see" in her minds eye how energy is transferred. It is very well designed. Great background information and demonstration idea. Not all concepts are appropriate developmentally for elementary students, but it's important for teachers to know this and to use these terms correctly. In the description for this resource it says it can be used for elementary school. When using the tool to see what standards it aligns to, it does not mention 3rd grade for NC. I do believe that needs to be updated. The very first video of the food dye is perfect for 3rd graders demonstrating the difference between hot and cold. The application and assessment provided within this resource are very helpful and a great way to see if students understand the concepts being taught. I do believe some of the videos/simulations provided are above 3rd grade level and I can understand from that point of view as to why 3rd grade was not listed for standards to align to. This mainly applies to heating things up, convection and conduction. The simulation for the temperature of molecules is perfect for having students understand friction and giving them a visual to what happens to molecules as the temperature goes up and down. The terms Thermal Energy , Heat and Temperature are difficult for many to understand as the terms heat and temperature are often interchanged. . The animations and questions give a good building of knowledge approach to rather abstract concepts. Great basic explanations - very clear and supported with good visual simulations. On the whole, this object is informative and the animations are very helpful. But I did find one major and one minor error. In the summary,it states "Heat always transfers from the object with more thermal energy to the object with less thermal energy" Temperature should replace thermal energy both times in this statement. An iceberg has more thermal energy than a cup of hot cofee, but heat would transfer from the cup of coffee to the iceberg. Also in the evaluation questions in the feed back on the carpet vs. tile question, it states that tile feels colder because it has more points of contact with your feet, but I believe it is really that the tile is a better conductor than the carpet is. The animations successfully illustrate the general concept. The simulation that demonstrates molecular motion is not technically correct; all molecules have the same speed, which is not true, as stated in this module. I would suggest the construction of a more realistic model, perhaps an implementation of a Leonnard-Jones potential to model particle interactions. It is stated that heat always transfers from an object at a high temperature to an object at a lower temperature. This is not always true. According to the statistical mechanics the micro-canonical ensemble, a heat transfer from a low temperature reservoir to a high temperature reservoir is possible, but not very probable. Maybe the creator of this module should “Stop Faking It” a take some refresher courses in the non-equilibrium statistical mechanics to correct his or her misunderstandings.